This weekend only, you could win a $200 gift card from Microsoft. All you need to do is visit your local Microsoft Store and try on the Microsoft Band, and you will be entered in a contest to win the gift card. And since the price of the device is $199.99, winning a gift card essentially means a free Microsoft Band is yours as long as you dip into your wallet to pay Uncle Sam. Oh, yeah. If you didn't get it from the Uncle Sam reference, this contest is taking place in U.S. stores only. While not everyone who tries on the wearable will walk away with the $200 gift card, every one who puts the Microsoft Band on their wrist will receive a $5 gift card from Starbucks. That is, as long as supplies last. The Microsoft Band is a fitness tracker that monitors your workouts and even your sleep. You can use it to set certain fitness and activity goals, monitor your heart rate, and it runs for 48 hours before needing to be charged. 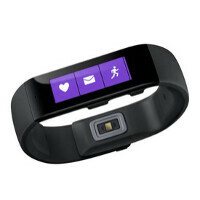 The Band will sync with the Microsoft Health app, available from the Windows Phone Store, App Store and Google Play. And while it is compatible with iOS and Android, if you pair the Band with your Windows Phone, it will integrate with Cortana. Yes, it does much more. Check out windowscentral.com they have good/great WP coverage including this. This is not uncommon nor particular to just the band. The band uses surgical steel, which some people are allergic too. MS has a 30day return policy, so no big. Makes me wonder how my skin is going to react, i dont wear watches or bands very often, tried a few like the fit bit pebble etc. But my skin has been odd lately with a rash on elbows for no reason, skin tests showed nothing when i went. So after that forum post, thanks for the info, i will have to make sure i wash the band portion of the metal contacts to avoid it. The fitbit irritated me but not rash like.